This document describes how to use H2O's generated MOJO and POJO models. Shared code between the H2O runtime and generated POJO and POJO models. Low-level information about generated POJO and MOJO models. The easy prediction API for generated POJO and MOJO models. Exceptions that can be raised by generated POJO and MOJO models. Prediction types that can be returned by generated POJO and MOJO models. Tools that use generated POJO and MOJO models. H2O-generated MOJO and POJO models are intended to be easily embeddable in any Java environment. The only compilation and runtime dependency for a generated model is the h2o-genmodel.jar file produced as the build output of this package. There are subtle differences between POJOs and MOJOs especially in the main.java file and in specifying the model output. If you are just getting started, refer to the Quick start sections for MOJOs and POJOs first, then look at the documentation for the hex.genmodel.easy package. H2O allows you to convert the models you have built to a Plain Old Java Object (POJO). POJOs allow users to build a model using H2O and then deploy the model to score in real-time. Note: POJOs are not supported for XGBoost, GLRM, or Stacked Ensembles models. If a confirmation prompt appears, click "Load Notebook"
From the "Flow" menu, choose "Run all cells"
NOTE: The instructions below assume the POJO model was downloaded to the "Downloads" folder. Create a new file called main.java (for example, using vim main.java) with the following contents. Note that the modelClassName must match the downloaded model name. // By default, unknown categorical levels throw PredictUnknownCategoricalLevelException. When viewing a model, click the "Download POJO" button at the top of the model cell (refer to the example in the "Quick Start" section). You can also preview the POJO inside Flow, but it will only show the first 1000 lines or so in the web browser, truncating large models. The PredictCsv class is used by the H2O test harness to make predictions on new data points. See the Consumer loan application github repository. See the H2O World 2015 Training github repository. A MOJO (Model Object, Optimized) is an alternative to H2O's currently available POJO. As with POJOs, H2O allows you to convert models that you build to MOJOs, which can then be deployed for scoring in real time. MOJOs are supported for AutoML, Deep Learning, DRF, GBM, GLM, GLRM, K-Means, Stacked Ensembles, SVM, Word2vec, and XGBoost algorithms. MOJOs are only supported for encodings that are either default or Enum. At large scale, new models are roughly 20-25 times smaller in disk space, 2-3 times faster during "hot" scoring (after JVM is able to optimize the typical execution paths), and 10-40 times faster in "cold" scoring (when JVM doesn't know yet know the execution paths) compared to POJOs. These efficiency gains are larger the bigger the size of the model. 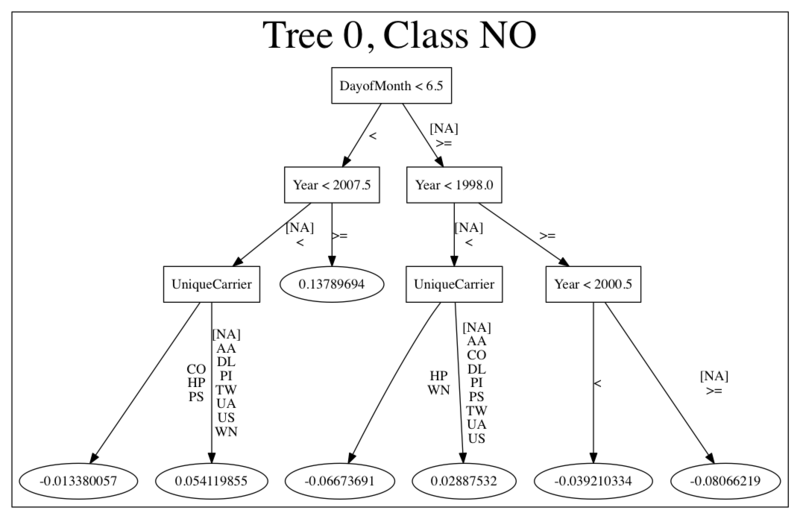 H2O conducted in-house testing using models with 5000 trees of depth 25. At very small scale (50 trees / 5 depth), POJOs were found to perform approximately 10% faster than MOJOs for binomial and regression models, but 50% slower than MOJOs for multinomial models. MOJOs are built in much the same way as POJOs. The example code below shows how to start H2O and then build a model using either R or Python. The examples below describe how to create a model using R and Python. The download_mojo() function saves the model as a zip file. You can unzip the file to view the options used to build the file along with each tree built in the model. Note that each tree file is saved as a binary file type. Download the MOJO and the resulting h2o-genmodel.jar file to a new experiment folder. Be sure to specify the entire path for the MOJO, not just the relative path. Open a new terminal window and start python. Create your main program in the experiment folder by creating a new file called main.java (for example, using "vim main.java"). Include the following contents. Note that this file references the GBM model created above using R.
GBM and DRF return classProbabilities, but not all MOJOs will return a classProbabilities field. Refer to the ModelPrediction definition for each algorithm to find the correct field(s) to access. This is available in the H2O-3 GitHub repo at: https://github.com/h2oai/h2o-3/tree/master/h2o-genmodel/src/main/java/hex/genmodel/easy/prediction. Compile and run in terminal window 2. The following code snippet shows how to download a MOJO from R and run the PrintMojo tool on the command line to make a .png file. To better control the look and feel of your tree, we provide two options for PrintMojo. ``--decimalplaces`` (or ``-d``) allows you to control the number of decimal points shown for numbers. ``--fontsize`` (or ``-f``) controls the font size. The default font size is 14. When using this option, be careful not to choose a font size that is so large that you cannot see your whole tree. We recommend using a font size no larger than 20.